Home » Food and Nutrition » Stop The Press! The Onion Voted Health Superstar! Stop The Press! The Onion Voted Health Superstar! When you think of the onion, what comes to mind? For one, it may not be the most breath-friendly vegetable—in fact, you’d better have a lot of chewing gum after chowing through an onion-heavy meal, as it can make the breath quite unbearable! Cutting into an onion can also bring tears to your eyes—but after reading this article, hopefully the onion will bring you tears of joy. A recent finding by the Endocrine Society revealed that the onion is actually one of the healthiest foods we could ever consume. When extracted, the onion has been said to improve blood sugar and cholesterol levels in the body. In a recent Endocrine Society experiment, researchers gave two doses of onion extract, about 400 and 600 mg per day, respectively, to diabetic rats. The rats’ blood sugar levels reduced by a staggering 50% and 36% compared to their blood sugar levels before they received the onion extracts. The study also revealed that their cholesterol levels dropped—astonishing results from a vegetable that many people try to avoid! Anthony Ojieh, the lead investigator in the study, concluded that the onion has great potential for treating patients with diabetes. Similarly, in a 2009 study published in the Journal of Medicinal Food, researchers evaluated the effect of onion and garlic extracts on diabetic rats. Although the effects of garlic extract weren’t too significant, the onion extract resulted in a reduction in the concentration of plasma glucose as well as body weight. The nutrients that you can find in onions are quite astonishing; onions are a great source of polyphenols and flavonoids, as well as fiber, folate, potassium, and manganese. Aside from improving blood sugar and cholesterol levels, onion extracts have been linked to fighting bacterial infections, mainly gum disease and other infections that can lead to cavities. Eating onions has also been linked to keeping inflammation at bay, because of the flavonoid antioxidants that they contain. In addition, The World’s Healthiest Foods web site states that consuming a few servings of onions each week can reduce the risk of some cancers, including ovarian, colorectal, and laryngeal cancer. Did you know that if you get bitten by a honeybee, you can apply onion juice to the area to get immediate pain relief? The phytochemicals in onions actually improves how vitamin C works in your body—this should give your immune system a proper boost! Add onions to your salad! If you’re eating healthy, chances are you are eating a lot of salads—next time, top your salad off with some grated onions. 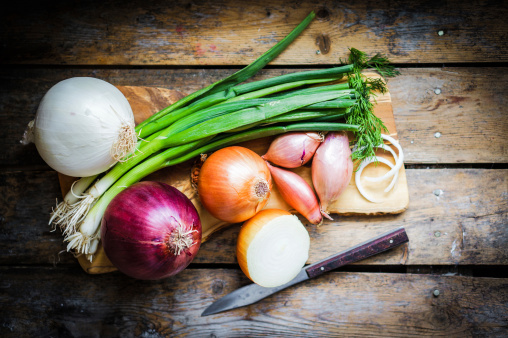 Add more onions to your homemade soup—it’s a delicious way to stay healthy and add flavor to your meal. If you love dips, try adding onions to a homemade avocado or guacamole dip. Serve with crunchy vegetables and you have a healthy, delicious snack. Now that you are onion-savvy, remember to always store your onions properly. Keep them at room temperature and away from bright lights; also make sure they receive good ventilation. The only exception to this rule is green onions—they should always be refrigerated. Krishan, S., “8 Great Benefits of Onions,” Care2 web site, November 30, 2012; http://www.care2.com/greenliving/8-great-reasons-to-eat-more-onions.html. Lilley, J., “Onion extract naturally improves blood sugar and cholesterol levels,” Natural News web site, April 22, 2015; http://www.naturalnews.com/049442_onion_extract_blood_sugar_cholesterol.html.